Handling requests for replacements of broken mugs. wife, but that works too). The workload of maintaining the website is very light. The site currently uses WordPress for designing and publishing pages. The site is hosted by Dream Host. It’s helpful if the webmaster has access to Office because much of what is sent from other officers will be Excel and Word documents. This person would coordinate the order and delivery of shirts with our club logo. Orders and payment are usually taken at the Doolie Brunch. The order deadline is in early July, depending on the supplier, so they can be distributed by early August. This will make them available for Parents Weekend. The Shirt Chairperson would work with the Secretary/Treasurer since the shirts are paid for when they are ordered. For the past two years, Lettermen’s in Mascoutah, IL, has been used as the supplier because the previous chairperson lived there and had positive experience with the store. 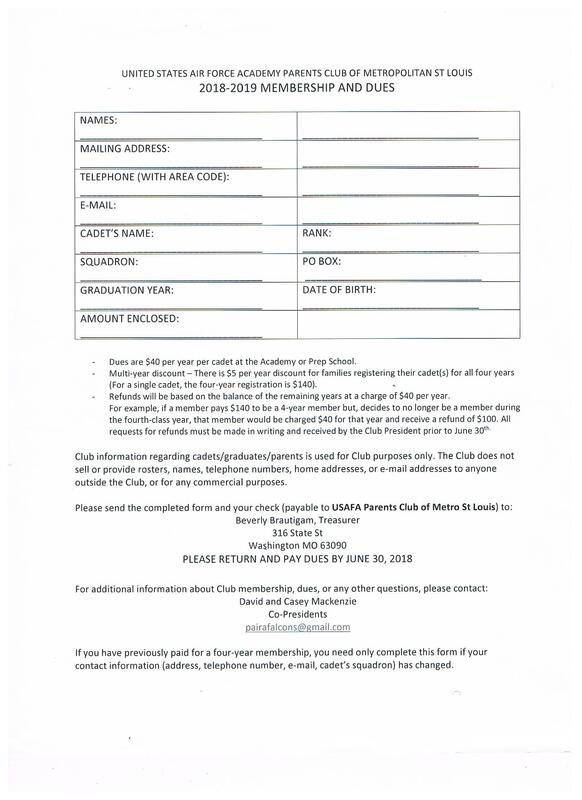 Maintains club roster and club records binder, take and distribute meeting minutes, obtain/mail quarterly cadet gifts, send out donation tax letters, collect membership forms and dues, obtain office supplies. Download a membership form to join our club! The Air Force Academy Parents' Club of Metropolitan St. Louis is a 501(c)(3) non-profit organization of parents, family members and grad parents of Air Force Academy cadets from this area. We are a support and assistance group. We support and assist each other, our cadets, and of course, the Academy's efforts on behalf of our cadets. We also provide information and encouragement to parents of prospective cadets.